If you’ve ever wondered what cartoon characters would look like if they were real people, then wonder no longer. Now, as for the result? Well… most of them look like nightmare fuel. Handsome folks like the Buzz Lightyear up there, created by graphic artist Raoni Neary, are few and far between. Most of the ones found and listed at YesButNoButYes are horrifying monsters. Especially the Family Guy characters, yeesh. I know most cartoon characters, by nature, have to have exaggerated nonhuman features, but I had no idea that their giant eyes and morbid obesity would be such a horrifying combination of features. Stewie’s football head doesn’t bother me, but Peter Griffin’s chin and Homer Simpson’s gigantic bugged-out eyes? Yeah, that stuff is stomach-turning. Sorry to spring it on you so early in the morning. 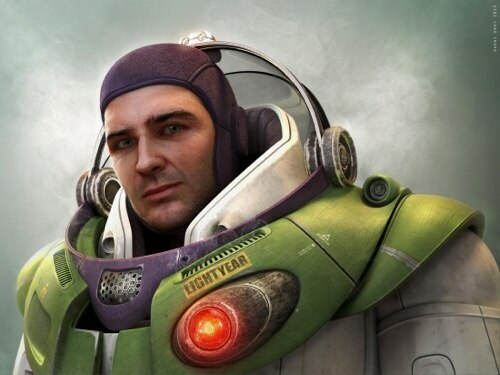 If it makes you feel any better, apparently the best person to play a live action Buzz Lightyear seems to be Bruce Campbell? Well, it makes me feel better anyway; that’s what matters.